Through projects and labels like Basic Channel, Maurizio or Main Street Records, the Berlin-based producer team of Mark Ernestus and Moritz von Oswald have exerted a decisive influence on the worldwide development of techno-house and electronic music during the 90s. Under the name Rhythm & Sound, Ernestus and von Oswald pioneered their own hybrid of Reggae, Dub and Electronics. In recent years, they have come up with their own and totally unique definition of Reggae. 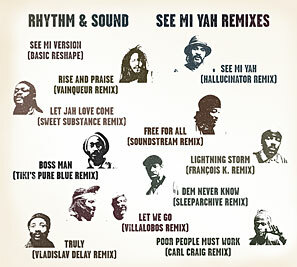 See Mi Yah (released in March 2005) is a classic One-Riddim-album comprised of ten vocal versions plus the original instrumental track of the ?See Mi Yah?-Riddim by Rhythm & Sound. 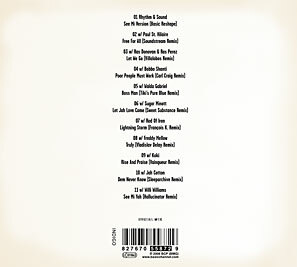 The album had previously been released as a series of 7?-singles (including three alternate versions of the instrumental track). On See Mi Yah one can hear the voices of Paul St.Hilaire, Ras Perez, Koki, Ras Donovan, Freddy Mellow, Walda Gabriel, Sugar Minott, Willi Williams, Bobbo Shanti, Lance Clarke as Rod Of Iron and Joseph Cotton aka Jah Walton as Jah Cotton. The remix-version of the album (which has also seen a previous release, this time in the form of a series of 12?-singles) transplants the 'strictly roots'-approach of the originals into the club. The result is a diversified collection of excellent club tracks. And while each of these retains its autonomy and its individuality, the whole album sounds as if carved from one piece. While listening to it, one simply forgets that this is a remix-album. From dry Digi-Dub, UK Steppers, Minimal Electronic and Disco House to deep atmospheric tracks, all kinds of current club sounds are represented here. With this project, Moritz von Oswald and Mark Ernestus ? who after all stem from a club music background ? have brought together several generations of DJs and producers. From collaborators of long standing such as DJ legend Carl Craig to promising newcomers, a great array of artists helped to create this album.